De toegang tot Locre Hospice Cemetery. Op de achtergrond 'Huize Godtschalck'. 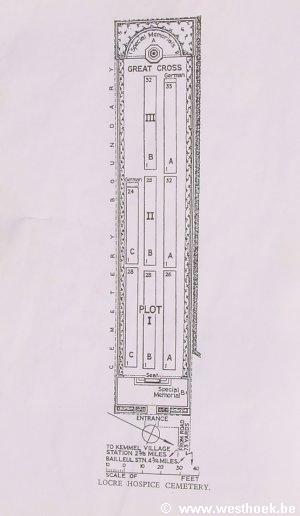 Het plan van Locre Hospice Cemetery. Een zicht op deze begraafplaats. Op de achtergrond de Kemmelberg. Een graf van een Jood. Vaak zijn deze te herkennen door de steentjes bovenop de grafsteen. 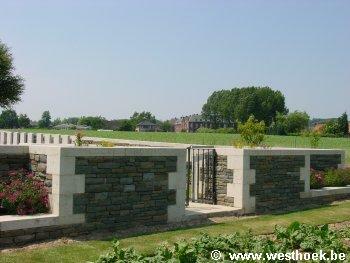 Locre Hospice Cemetery is located 10.5 kilometres south west of Ieper town centre on the Godtschalckstraat, a road leading from the Dikkebusseweg (N375). From Ieper town centre the Dikkebusseweg is reached via Elverdingsestraat, straight over a roundabout onto J.Capronstraat (for 30 metres), then left along M.Fochlaan. Immediately after the train station, the first right hand turning is the Dikkebusseweg. On reaching the village of Loker (formerly Locre) the first left hand turning leads onto the Kemmelbergweg. There follows an immediate right hand turning onto Godtschalckstraat. 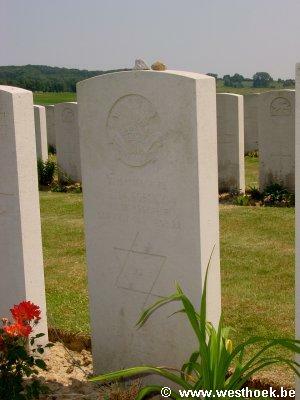 The cemetery is located 900 metres along the Godtschalckstraat on the right hand side of the road. A small 20 metre grassed access path leads to this site. The village was in British hands during the greater part of the war, and Field Ambulances were stationed in the Convent of St. Antoine, which was occupied also by Nuns; but on the 25th April, 1918, the village was captured by the enemy. It was recaptured by French troops on the 26th, lost on the 29th and retaken by the French on the 30th. The Hospice, or Convent was the scene of fierce fighting on the 20th May, but was not finally retaken until the first week in July. 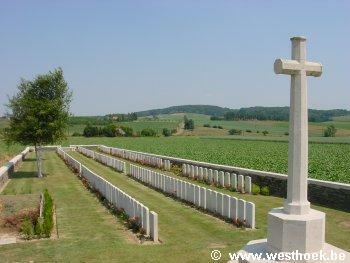 The Hospice Cemetery was begun in June 1917 by Field Ambulances and fighting units, and was used until April 1918. 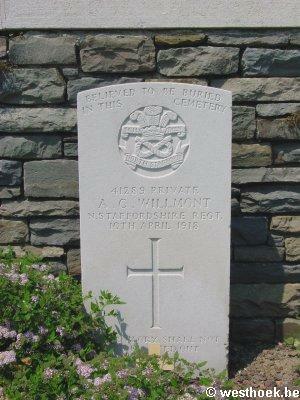 After the Armistice four graves were transferred to it from the garden of the Hospice, which was ultimately re-built. 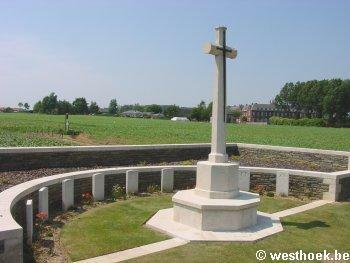 There are now over 200, 1914-18 and over 10, 1939-45 war casualties commemorated in this site. Of these, a small number are unidentified and 10 graves were destroyed by shellfire and are now represented by special memorials. The cemetery covers an area of 851 square metres, without including the footpath leading to it and is enclosed by a rubble wall.